Now fan might be too small a word. 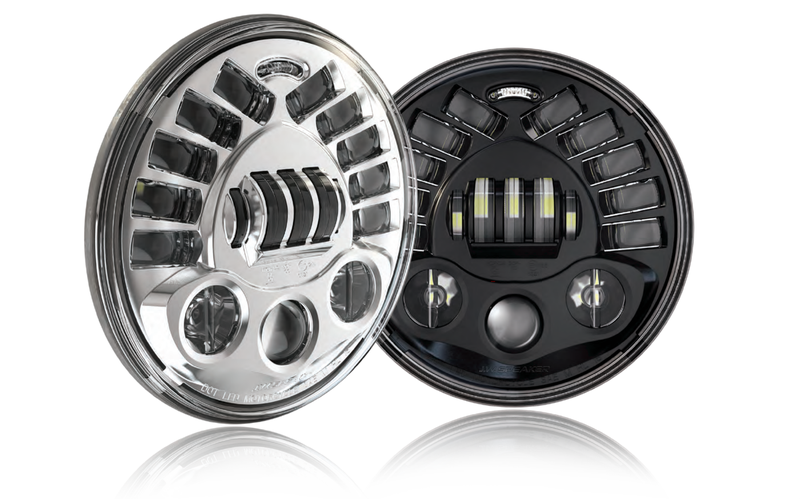 JW Speaker’s new 8970 Adaptive Matrix headlight unit dials it up a notch. I liked BMW K1600’s adaptive mirror-articulating headlight, but wished the halogen projector was LED... now no need. Now I know what headlight I am putting on my future bike, and planning in all my custom builds that roll around my head. Hopefully it will fit well in an interesting half fairing. Actually, I really don’t like the fairing on the custom RNineT with the orange frame... but I like the rest of the bike, and would want one of these other half fairings, with the JW Speaker adaptive headlight installed. I think the Hondaline fairing with the airfoil screen, and the covered-headlight could look really cool on the RNineT, even if it is cross-brand sacriledge. I really wish the Moto Guzzi V12 Griso 8-valve bike came with a LeMans upgrade, with the V11 LeMans’ fairing on the newer bike. Any of them would be a great candidate for an adaptive LED headlight upgrade. Recent from BoxerFanatic, troublesome iconoclast. Damn, Doug, why did you have to make me miss my old car so much?